On November 22, 1963, several crimes occurred in the city of Dallas. The murders of JFK, J.D. Tippitt and Lee Harvey Oswald gripped the nation and dominated news headlines here in America and abroad. The investigation that followed was intended to be an open and shut case, but when we look back in hindsight, we are able to see that it was anything but. One of the most disturbing aspects of the crime, is the illegal removal of Kennedy’s body from Parkland Hospital. Far from standard procedure, the removal violated Texas State Law and raised endless suspicious about the actions of the Secret Service and Lyndon Baines Johnson. The Warren Commission and its report created more questions and provided fewer answers. To this day, chilling and horrific details about the handling of Kennedy’s body continue to come to light showing a dark and sinister plot in effect. 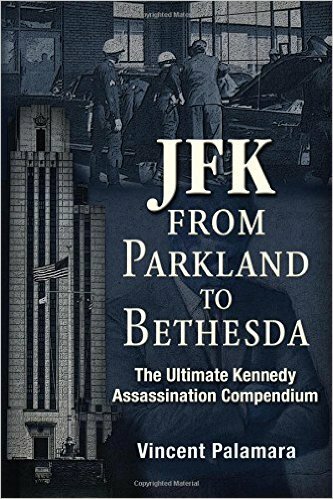 Vincent Palamara has composed the ultimate compendium, based on testimony of those involved, as to what occurred regarding the shots in Dealey Plaza, the arrival of the motorcade at Parkland Hospital, the treatment of the President up until his death, the removal of the body, the trip to Bethesda and the controversial autopsy that followed. Presented in a reference format, the key portions of testimony are provided in an outstanding reference format. And as we follow Palamara’s chronology, we are able to visualize the horror and anguish that gripped the halls of Parkland Hospital. The Zapruder film showed the public the devastating head wound suffered by Kennedy and the aftermath that followed in the motorcade. But it is through the testimony of doctors that we can began to truly understand the violent and gory death that Kennedy suffered. And even more disturbing is the secretive and deceptive transport of Kennedy’s body to Bethesda Naval Hospital, a later change from the intended Walter Reed Hospital. The true gift of this book is not that Palamara is writing his own opinions, but that the details we learn come directly from those who were there. And through their words, that the true horror of that day comes to us refusing to leave. Posted on March 10, 2016, in Assassinations and tagged JFK. Bookmark the permalink. Leave a comment.